Most PowerBook G3 owners I know of want to upgrade their internal CD-ROM or DVD-ROM drive to something faster and more flexible. The problem is that most new drives for sale around the Net are over $100 and are simply not worth the investment. In this article I'll show you how to swap your existing drive for another one. These instructions should work for any PowerBook with a removable optical drive, including the PowerBook 1400 and the G3 models. The best place to get your "upgrade" drive is from a broken PC laptop. Chances are it will work, because most laptops have used the ATAPI 50-pin standard for over 10 years. 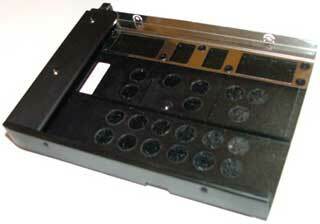 Remove 6 screws from PB G3 tray (see photos above) or 4 from PB 1400 tray. Pull out the original drive. Place the new drive in the tray. Replace the screws (only 4 are required on some drives). Install PatchBurn for iApp/OS X compatibility. After you install the new drive, it automatically works with Toast. To get your iApps working, download and run PatchBurn. PatchBurn installs new drivers in Mac OS X so that it will support your replacement drive. In most cases the new drive will not have the same size and shape as your original Apple drive. 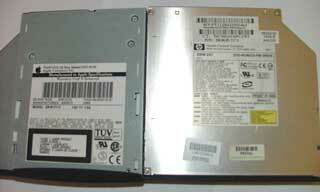 It's possible to switch the faceplate on some drives, but those are rare, so you'll see a funky looking drive in your PowerBook (see photo). But remember that now you can burn CDs (and possibly DVDs), which you couldn't do with your original drive.